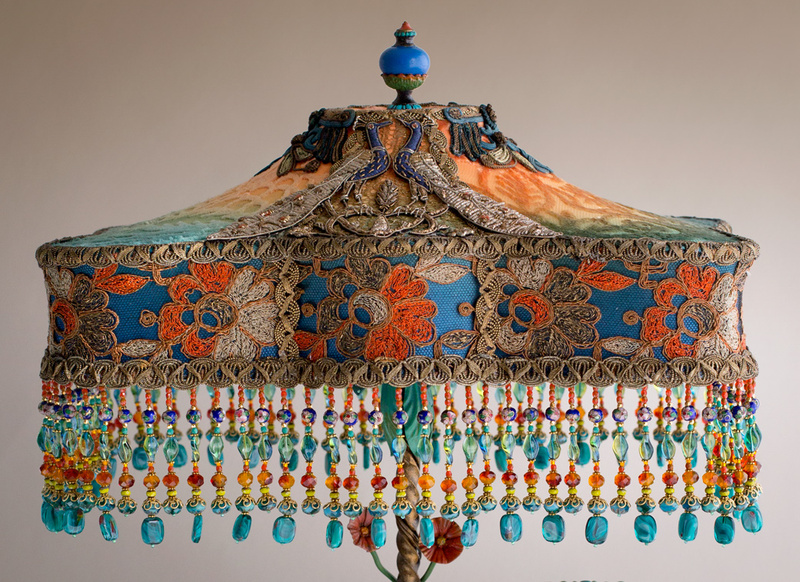 Wonderful 1920s tole base with flowers and leaves and beaded drops holds a Double Peacock shade with antique fabrics and appliqués. The shade is ombré dyed from deep golden amber to Cerulean blue with accents of teal green and is covered on the top with ombré dyed burn out silk velvet. Antique gold lace is in the small top panels and the cuff is embellished with colorful 1920s embroidered net. The front panel features a pair of vintage peacock appliqués from India. Two wonderful Art Nouveau passementerie appliqués purchased in Paris adorn the top. This lights up beautifully with a warm firelight colored glow. Colorful hand beaded fringe with European and cloisonné beads adorn the bottom. Overall height is 20 inches to the top of the finial.